Mike Gleason: It is my privilege now to welcome in Greg Weldon, CEO and president of Weldon Financial. Greg has over three decades of market research and trading experience, specializing in the metals and commodity markets, and even authored a book in 2006 titled Gold Trading Boot Camp, where he accurately predicted the implosion of the U.S. credit market, and urged people to buy gold when it was only $550 an ounce. He is a highly sought after presenter at financial conferences throughout the country, and is a regular guest on financial shows around the world, and it's great to have him back here on the Money Metals Podcast. Greg, it's nice to talk to you again, and thanks for coming on. Greg Weldon: It's my pleasure, Mike. Thank you for the invite. Mike Gleason: Well before we get into other stuff here, Greg, one of the big stories early this year has been the plunge we're seeing in the U.S. dollar. Precious metals and commodities have been getting a boost, but it doesn't look to us like metals have fully priced in all of the weakness we've seen in the greenback, which lost 10 percent in 2017, and is off to its worst start in decades so far this year. Meanwhile, metals are still trying to retake their highs from last September. 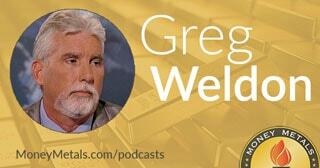 What are your thoughts on gold and silver prices relative to what we've seen in the currency markets, Greg? Greg Weldon: Well, I think the first part of the question is important to answer first, in terms of the dollar, because it's important to kind of note the evolution that's taken place in the dollar. And like you accurately stated, it was down all of 2017. It was under pressure. So, while this latest slide has caught the attention of the markets, it's been in depreciation mode for 14 months. I think that the reason that the most recent move has caught the attention of the media, particularly, is the fact that you have a secular breakdown. When you took out 9100 in the dollar index, you really have kind of completed a rally phase that was predicated upon ... at first, you kind of saw that real acceleration here in the dollar and the upside off of the gains in this recent move to its highs, 2016-2017, was predicated upon the Fed dot plot. Which, when they went from taper to tap out, in August of 2014, meaning, that they stopped buying bonds, fresh bonds completely. In other words, not printing new money, not buying fresh bonds, only reinvesting the proceeds from maturing bonds, which they're not doing anymore. What happened was that they were projecting a three and a half to three seventy-five Fed funds rate, by now. And that dynamic really boosted the dollar, thinking you were going to have a huge interest rate differential going out in the future. More recently, as the Fed kind of doved down their dot plot over time, you had the dollar start to track U.S.-German long bond yield differentials more tightly than anything else. And what we have seen really, since November, is a shift away from that now. And the newest evolution is for the dollar to kind of… and I don't hear much talk about this, which is interesting… if you listen to the pop media at CNBC and so on and so forth, you hear kind of, some mystery around why is the dollar declining here. Because, the economy's strong and interest rates are going up and the dollar should be rising, right? Well the dollar is also tied to the U.S. budget deficit. If you track this out over the last 15 years, you could see a direct correlation. What we know to be happening is the budget deficit in the U.S. is widening again. It widened last year, to very little fanfare. It's just shy of 700 billion. It's widened by 10% in the first two months of the fiscal year, meaning October-November. December data's still pending. And, this is a problem in terms of, you already have 20 and a half trillion dollars that you have to now refinance, refund, at interest rates that are higher than they had been refunded in the past, really, for the first time in a long time. And this is going to add to that deficit, significantly. You're looking for a deficit in here that could be over a trillion dollars in fiscal 2018. And that's a real negative for the dollar. And that's before you really consider the full extent of the cut in revenues, that will result from the tax cuts. And the potential here if they put an infrastructure program in place, that will deepen the deficit even more. And to me, that's a secular long-term fundamental flaw in the dollar. And we're seeing that reflected in the price action. Now you're right to suggest that maybe gold and silver should be higher, based on this. I think there's maybe two reasons for that. Number one, there is some kind of, almost disbelief in the dollar's decline. So I don't think people are rushing into metals. Because I think there is some complacency around the dollar's decline here. And I think there is some thought process to be had here that if you were to see the stock market turn here – and I think we're really close to that. We've been kind of anticipating that for a while. I think the tax program kind of pushed the timetable back a little bit. But you could be in a situation where you kind of have all asset prices declining. And maybe gold gets caught up in that. So, with all that said ... and gold made a pretty long trip from $1,205 to $1,360 here. So, it's a pretty decent sized rally, frankly. I think from here the prospects for gold and silver are excellent. If you take out this $1,377 high that we have, that's going to violate the trend line that goes back to the 2011 high. And as you know, we've talked about this before. This is a long term, multi-decade secular full market. We can, in fact, trace this all the way back to when the U.S. took the dollar off the gold standard. And the correction you've seen since 2011 was almost a perfect 50%. It was ABC. And it kind of sets the stage now ... it was wave four of this grand super-cycle bull market, if you want to get into the cyclical talk. So I think a breakout above $1,377 will happen. I think it will come in context with further weakness in the dollar this year, as the deficit deepens further. And you're going to have a real solid move over the next three to five years. So, is it a little bit disappointing here? It is. But I think you've got to be patient. Because I think it will, in fact, play out in a bullish way for the metals. Mike Gleason: Yeah. Certainly that overhead resistance level for gold there in the $1,370-$1,375 range has been pretty significant. It'll be very interesting to see once we get up to that range again and see if it can finally bust through it. Now inflation expectations have been creeping higher since the election. With the recent tax cuts we may start seeing the CPI actually move significantly higher. If the President is successful in his push to spend 1.5 trillion dollars on that infrastructure plan that you alluded to in your first answer. Price inflation is likely to become a significant driver in our markets. Higher prices are, of course, the flip side of weakness in the dollar, and could be a catalyst for buying in precious metals. Now, President Trump's agenda look like it was in trouble for the first several months of his presidency. But he seems to have the momentum behind him now. So, how do you rate the chances of a major infrastructure program getting pushed through Congress? And then talk about the potential effects on markets. Greg Weldon: Well, I don't know what the chances are. I think, like you said, he's got some momentum here. And I think it would be tough to debate that the country doesn't need it. I mean, in terms of infrastructure. Not even in terms of politics, or in terms of any of the rest of what we're talking about here. There's no doubt. I mean all you got to do is try and get from New Jersey to New York, and you can see how eroded and kind of almost decrepit some of the infrastructure is, around transportation in particular. Around water, here in Florida where you have some real issues with Lake Okeechobee, and overflow ... There are major needs in the country for infrastructure. So I think it becomes less of a political hotbed than, say, something like tax cuts or immigration. So I think, from that perspective, the chances increase for him to push it through. And in that same context, I have heard very little talk in this tax program about how it affects the deficit. So, I don't know that the deficit hawks are really out there in full force. And frankly, if the Democrats are going to come here and they're going to fight infrastructure on the back of ... It's going to increase the deficit and going to increase debt. Well, where have they been for the last eight years during the Obama administration, when we went from nine trillion in debt to twenty and a half trillion. Okay, so for them to come out now and be against this kind of thing would seem kind of hypocritical, to some degree. So I think all these factors bode well for the package to come through. I think the dollar's decline, frankly to me, is more critical in terms of the inflation outlook, because it affects commodities. And if you look at where gasoline is now, it's been kind of contained in the inflation dynamics, because you are in the winter months when gas demand is lower. If you look at the gasoline strip – the board in the futures market – starting in April, you're looking at about a two dollar ten price for gasoline. And while, you're not seeing increases at the pump that impact consumer spending as much, this will work its way into the inflation data. Just because of the way it's calculated. So, you were a dollar fifty-four, last April. You're two ten now. That's a big increase. And that's going to have an impact on CPI numbers. It's going to be similar to what we saw last year, around this time, when February's inflation number was a big number, two point seven on the headline. And a lot of that was because of the year-over-year impact in energy. Now, you could say, that diminishes the importance of the CPI readings. But that's problematic in the sense that CPI at the headline rate is already above two. And the Fed is making their changes, really since September everything changed for the Fed, because it no longer became about the dot plot. Because the dot plot had been doved down to the point where it was more realistic, frankly. And so, with the Fed basically saying we want to get to neutral, alright? Throw this normalization out the window. I hate that term, because nothing is normal about any of this. The new normal is what it is. What they really want to do is get to neutral. And part of the reason, if you read what they say, and what the minutes say and what their speeches say. They want to get to neutral, so they can have some policy option symmetry. Okay? They've had an asymmetrical setup, where they have a lot more room to tighten than they do to ease. And frankly, the Fed is worried that if the stock market cracks, it could take this whole economic optimism and turn it the other way, that they might have to respond. And what they don't want to have to do is unwind shrinkage, where they're shrinking their balance sheet. And they have said this. They have said, when we have to make our next policy moves towards easing, we don't want it to be QE. We want to have room with interest rates to move. So, in essence – and they are very clear on this – they wanted to bring the short end of the bond market to the level of inflation. And that has happened already. So now the question becomes, what if inflation goes higher? What if inflation? Dollar down, commodities up. The one thing that's been missing is food inflation. Look at the ag markets. They're all at pretty much close to their lows. It was a really down year for the ag markets last year. And it has held inflation back. We've also seen that, though, and the year-over-year rate go from negative, to 0.9% was the last CPI reading for food on the year-over-year basis. You have the ag markets set up now to benefit from the lower dollar. And you also have the ag markets set up to where the risk reward margin here, in terms of the supply versus demand ... I mean, the markets are down because of huge supply of grains. Alright? In South America, where now you have a really severe drought going on, by the way, in Argentina, which is affecting soybeans already. But you have no margin for error, because, yeah, supplies are record, but so is demand. So, the margin for some kind of weather event in grains, let alone the positive impact you're already going to have from the dollar, sets the stage for something more significant in inflation down the road that this has not priced this into the markets at all. So you've taken the two year note, for example. I mean, when it took out 140, we said straight up it's going to two and a quarter. It's there now. It's made the adjustment. What happens from here if inflation goes up? And that could be really problematic for the bond market, in turn for the stock market, in turn for the deficit because now you're paying even higher yields to refinance the debt, every quarter, so on and so forth. So I think inflation is the big wild card for the year. I think the ag markets are a big part of that story. And I think it sets up for some really interesting action, probably beginning sometime April-May. Mike Gleason: Expanding the point here on commodities and precious metals a little bit with that inflation story. Any of, maybe the metals in particular piquing your interest? Copper had a real good run late last year. It's kind of been languishing a little bit, silver. What do you have to say about maybe some of these industrial commodities if we'd see this big inflation play? Greg Weldon: Yeah. I do, in fact have, platinum on my radar screen. And for a couple of reasons. First, the infrastructure dynamic. Second, there's some talk in the EU and other places about substituting platinum for palladium, in terms of auto catalytic converters. The expectations are that after some down years, jewelry demand's going to be higher. And, all that plays into the fact that platinum, at $350, give or take 20 bucks, discount to gold, historic levels, makes me very interested in platinum. Not only that, but platinum has rallied up to this ten and a quarter level. You have some real long-term ... $1,377 in gold equates to kind of $1,026 in platinum. So, if platinum gets above $1,026, and it's made a decent move already again. So, a pause here wouldn't be out of the question. Platinum is on my radar screen. And I think, given its discount to gold, and given my outlook for gold, that bodes very well for platinum. In terms of copper, it's not my favorite industrial metal. I think it is over-owned. If you look at the commitment of traders, you look at open interest... people have already bought into copper on the anticipation of infrastructure spending. So I think the bang for your buck might be greater in other metals. And I think other metals are actually situated better from a supply-demand fundamental. If you look at copper, the swap rates are at new lows. So, the copper is amply supplied right now. The speculative position is predicated upon future demand that may or may not materialize. When you look at some of the other markets, zinc, aluminum, even nickel, which has kind of been the weak link, they're more attractive to me than is copper. So if you're interested in buying base metals, one of those three would be a preferred choice. And I would really keep an eye on platinum, cause that could be a surprising market this year. Mike Gleason: Stocks keep soaring, and we've been looking for a correction, or a significant correction for quite a while given just the incredible P/E ratios that we're seeing here. Does it have longer to run here? It sounds like you think maybe May is a point where we might start to see some things roll over. Just give us some of your thoughts here on the equities. Greg Weldon: I think you're really close Mike. I think when you kind of overlay the 2-year note with the stock market, it provides an interesting correlation because they've moved up together. And it looks to me like this would be a point where maybe you start thinking that the bond market decline, in price, and rise in yields takes a break. Every metric that you want to march out in front of us here, is negative for the stock market. Whether it's the Case-Shiller at 33, which is second only to 2000. In fact, many of these things outside of the market cap to GDP – which is at a new record high – the bulk of those indicators that I use, and a lot of people use to kind of determine where the stock market is undervalued, fair-valued, overvalued – say it's the most overvalued it's been since 2000. And we know what happened in 2000. It was a blood bath. And, you can make the similarities of tying it into tech, too, because that was the dynamic during 1999-2000. It's a similar dynamic here, in terms of the leadership and the really lofty, frothy levels to which some of the tech stocks have gotten. And we've talked about this before. I was kind of thinking it might happen. I thought it might be kind of buy the rumor, sell the fact on the tax cuts because you had the big rally leading up to the passage of the bill. I thought that might be kind of a denouement. But it's actually kind of extended it. Why? And that leads back to the consumer. Because the consumer has gone on a borrowing spree that is unprecedented, really for the last 39 months. And specifically in November. And specifically, now in credit card debt. And this is linked to… guess what? We got a tax cut coming. We're going to have more money next year. We're willing to spend a little more and run up our debt even more, because we feel we have that money coming. Alright? So the numbers around November, around Black Friday, around Cyber Monday, were astronomical. Almost insane numbers. So, the question becomes, does that money get paid back with tax cuts? Probably not. You're already seeing delinquency rates rise. You have record levels in terms of the, just nominal amount of debt. So, I worry about the consumer, too. And how that maybe has been something that has put the stock market timeframe back a little bit. And then certainly you've had a tremendous amount of cash come into the market since the tax cuts were announced. But I think right here, literally like in the last 48-72 hours, you've seen kind of a shift in momentum. You're at such levels where things could happen, from a fast and furious standpoint. If people go to liquidate. God forbid, people go to take profits here. And, when you look at the high-flying tech stocks… and again, we have talked about this before… but you talk about Amazon at a $1,200 or $1,300 dollar per share price. You have pretty much, everyone that wants to own these stocks, owns them. The ownership is huge. It's through the roof. At the same time, because of the high nominal price of one single share, volume has virtually dried up. So what happens if they go to sell, and nobody's there to buy? You have the setup here, from psychological, from kind of the fundamentals, in terms of the overvaluation… and then, just in terms of some of the logistics of the best performing stocks, for there to be something of an accident here. So, I think the writing is on the wall. And the other thing I will say to that is, the bond market ... People say rising rates haven't affected the stock market. That's absolutely not true. You have already seen the utilities breakdown. You have doubt theory divergences here that are very significant. You have the REIT's on the run. You've got the NBS market on the run. Junk is close to breaking down. So, I think there has been an impact. And it is visible, if you look at it. We're actually long the REIT short ETF. And it is performing. So you have seen the interest-sensitive sectors of the stock market already affected. And man, does this not remind me, personally, of 1987. Where you went months and months and months with a bond market getting trashed, every single day. The T-bond was down 2-3 points, many days in a row. And no impact on the stock market until there was an impact on the stock market. And it was delayed by about nine months. You're kind of in that time frame here. So, you've got a lot of things that are converging here to suggest that the risk-reward, right now, does not favor buying stocks here at all. And in fact, I think the risk is significant, of some kind of major correction. Mike Gleason: Well, as we begin to close here, any final comments on what you're watching for most closely? Maybe some of those trigger events that could really make waves in the markets and kind of get things going? And then, also, what kind of year do you think it's going to be for gold and silver in 2018? Greg Weldon: I think there's great opportunities for trading, because I think what really kind of made change and is already showing us some sign of changing, is volatility. I mean this market run has been – even in the bond market – the rise in yields has been very condensed, in the sense you don't see wild swings. It's just kind of up a little bit every day in yields. You've seen that kind of same thing in the stock market. I think I heard somewhere you haven't seen even a 1% rally in a single day since September. And you hadn't seen a 1% decline in stocks since August until this week. So I think one of the things that has been kind of just put on the back burner ... That people aren't even paying attention to but it's still kind of on the boil, is volatility. So, I think from the perspective of actually trading these markets you've got great opportunities. I think the short side of the stock market will be a great opportunity here somewhere. I think the long side of the commodities markets will be great opportunity. And I think gold and silver are poised to break out, along with platinum. So I think, at the end of the day I think 2018 offers great opportunities for people that are diversified and willing to be long or short, that are flexible, that are nimble. That can kind of pay a little closer attention than your average retail guy might. I think that the opportunities this year are going to make 2018 a great trading year, much better than we saw last year. Which wasn't a bad year, frankly. It was pretty good. Mike Gleason: Well Greg I know you haven't been feeling your best this week, but I really want to thank you for joining us nonetheless. We've really enjoyed having you on and appreciate your insights on the state of today's financial world. Now before we let you go, please tell folks about Weldon Financial, how they can find you, and any other information they should know about you and your firm. Greg Weldon: Sure. Thanks, Mike. Well, we do Weldon Live, which is a daily ... I put in parentheses almost daily because I do all the work myself. And we cover everything from top-down global macro dissection of data ... ISMs is on the docket for today, for example. We'll break that down to its real detailed, micro level. Then we do foreign exchange, fixed income, stock indexes and ETF's, industrial and base metals, ags and energy. So, we cover everything. I’ve been doing this for 33 years. We welcome any and all of your listeners, who have not had a free trial subscription to our service, to come to Weldon Online, that's WeldonOnline.com. And sign up for a free trial to our Weldon Live. We also have what we call trade lab as part of the service. And that is specific trading recommendations, including entry and exit points. Kind of longer term stuff. The differential between traders and investors has become very blurred these days because everyone's a trader now; nobody's an investor. To try and handicap these markets five to ten years out. Unless you're really young and you're just getting started. The stock market's been commoditized to a large degree. So, everyone's a trader, and from that perspective the service is useful to anyone out there. Whether you're retail, an individual, and we have some of the world's largest hedge funds as our clients as well. So, we welcome anyone to come check it out. Mike Gleason: Well good stuff, Greg. Thanks again for your time, and hope you have a great weekend and look forward to catching up with you down the road. Greg Weldon: You too, Mike. Thanks. Always a pleasure. Mike Gleason: Well, that will do it for this week. Thanks again to Greg Weldon of Weldon Financial and WeldonLive. For more information, simply go to WeldonOnline.com and we urge everyone to sign up for a free trial there. Again, you can find all of that information at WeldonOnline.com. Be sure to check that out. And don’t forget to check back next Friday for the next Weekly Market Wrap Podcast. Until then, this has been Mike Gleason with Money Metals Exchange. Thanks for listening and have a great weekend, everybody.